Don’t forget HarBUG AGM on Wednesday 2nd October! From 1230 to 1330 in Lounge (top floor) at Ridgeway House, Fermi Avenue (behind Nursery). If you would like to get involved with the running of HarBUG and join the Committee, please let me know (secretary@harbug.org.uk) asap. And please let me know (secretary@harbug.org.uk) asap if you would like to add other discussion items to Agenda. 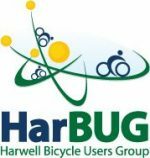 The HarBUG AGM will take place on Wednesday 2nd October from 12:30 to 13:30, in the Lounge (top floor) at Ridgeway House. Ridgeway House is on Fermi Avenue opposite RAL Main Entrance, just behind the Nursery. Please put the date in your calendar and attend if you can – feel free to bring your lunch with you. If you have any proposals / issues you would like to discuss please let the HarBUG secretary, Guy Wilkin secretary@harbug.org.uk , know before Friday 27th September. All HarBUG committee posts are up for election so if you would like to help out running HarBUG please contact the secretary. The posts up for election are; Chairman, Treasurer, Secretary, Web Master plus general committee members.